London (AFP) - Newspapers declared Thursday a "day of destiny" in dramatic front pages streaked with blue, white and red as Scotland votes on whether to split from the United Kingdom. On a front page covered with the Union Jack, which may have to be altered if Scotland chooses to become independent, The Times called Thursday "D-Day for the Union". "The break-up of Great Britain and Northern Ireland may be imminent," the paper wrote in an editorial. 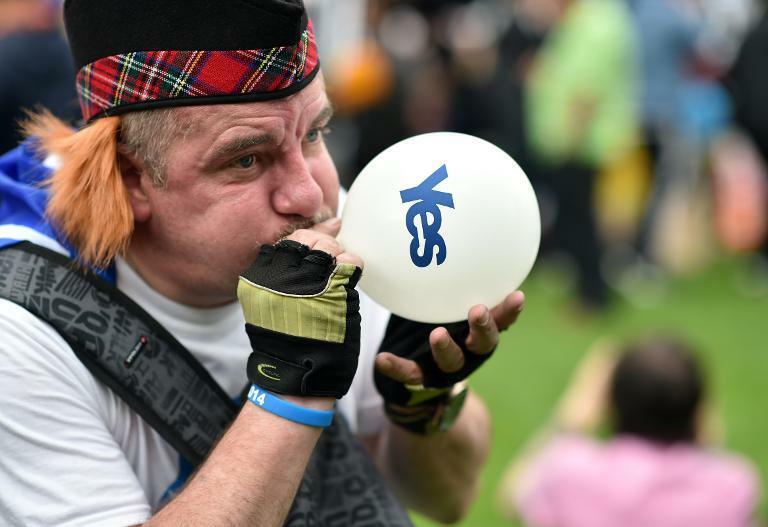 "Something priceless is lost by dividing, something preciously cultural and intangible as well as something drily economic and rawly political... we urge Scots of all persuasion to vote "no" to independence - and to do so with great national pride." Only one major newspaper has backed independence - Glasgow's Sunday Herald, which on its last edition before the vote chose a front page mosaic of hundreds of "Yes" voter selfies forming a Scottish blue and white Saltire flag. The Guardian's Thursday front page showed an aerial picture of Scotland with sea submerging the other parts of the UK. "Day of destiny. Scotland's 4,285,323 voters have 15 hours to decide their country's fate," read the front page of the newspaper, which urged Scots to reject independence and help "reforge our union" together. The Scotsman also put "Day of destiny" as its headline but chose an accompanying picture of a referendum polling station. Record numbers are expected to vote. The front pages of several newspapers were rich with symbolism. "Yes or no. Today Scotland starts with a blank page" was The Scottish Sun's headline, over a blank front page with images of hands holding pens, ready to write. The Daily Mirror showed a man holding up a white and red union jack, missing the blue colour that represents Scotland in the flag. "Our day of destiny" the newspaper wrote. "Don't leave us this way.... Don't let the sun set on our 307 years together. Vote No today & keep Britain truly GREAT." Meanwhile, the Scottish Daily Mail showed the Saltire and Union Jack tied together in a knot. "It has been the bedrock of our greatest triumphs and united us during our darkest hours. Today, let us secure Scotland's future in the glorious and remarkable family of nations that is Great Britain," the front page read. The Independent's front page referred to the centuries the countries had been united since the 1707 Acts of Union, with a headline "The 307-year itch". But business paper City A.M. chose an economic angle, with its front page headline "Better together, poorer apart" with a letter from the editor warning of economic risks to independence. Refusing to pick a side, the Metro splashed the word "Vote" in thick black letters over its front page. "Instead of pontificating on the rights or wrongs of independence, we merely urge all of you to take part in one of the most significant moments in the long and illustrious history of our country," the daily wrote. "That's why Metro simply says... Vote."